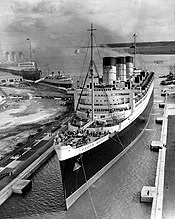 The Queen Mary was in service for decades as both a World War II transport ship and a luxury liner. It wasn't intended as such at the time, but the Queen Mary was named "The Grey Ghost" during the war because of the color she was painted to make her stealthy in the war-time waters. In her time, the Queen Mary carried seasick sailors, destitute stowaways and wealthy vacationers. With this kind of history it's not surprising she saw her own share of deaths, now a hair shy of 50. In fact, there are so many haunting that some parts of the ship are now barred from the public. But for the paranormally curious there are still haunted tours of the cabins and halls that housed death. You can also lodge at the Queen Mary but after reading this, you may have second thoughts. Of the numerous deaths, there was a young seaman by the name of John Henry who lied about his age to procure a position on the Queen Mary and was soon crushed to death while trying to flee a fire. To this day, knocks and bright lights can be heard around engine room 13 where the young man met his untimely death. Ịt's even been reported that the door to the engine room is sometimes hot to the touch or that mixed in with a ball of light is tendrils of smoke. If spooky little girls like the ones in the Shinning scare you then you'll want to stay clear of the pool area. A girl from third class thought she'd have some fun and slide down the banister but a sudden wave upset her course and she broke her neck on the fall. She now wanders the pool area and nursery looking for her doll or mommy. She is not alone though. In the 30's and 60's two other women met their unfortunate deaths in the pool area and are seen periodically in that area. War always brings atrocities but how about a cook that was cooked because the troops on board didn't like his meals? They stuffed him into the oven and burnt him alive as a lesson for bad cuisine. His screams still echo his horrible death to this day. If you're still feeling brave enough to consider sleeping on the Queen, there was also a reported visitor that slipped a steward some cash in exchange for finding a 'willing' female passenger to keep him company for the night. After stowing his luggage, a female companion was found and they retired for the night. In the morning the man was missing from the dining hall so the steward went to find him. What they found instead was the corpse of the female companion! They could not locate the male guest, his registration information for that room nor his luggage, which people swore was checked and stowed. He simply vanished and left only a trail of blood and rumors. The Queen Mary is home to 49 deaths but she was also surrounded by death. In an attempt to avoid enemy ships, she zig zagged her way into her companion ship, nearly cutting it in half, and was forced to leave 300 survivors in the water to be eaten by sharks or drowned. It is reported that mysterious pounding on the side of the Queen Mary is those men trying to signal to come on board.